BigPr.es is a Premium WordPress plug-in that allows you to easily showcase merchandise from your BigCommerce store directly in your blog. Remove the burden of uploading and hyperlinking images and ensure a consistent content-to-cart experience. Start showcasing your products on BigPr.es for only $89 per year. We're so confident you'll love it, we offer a 30-day money back guarantee. 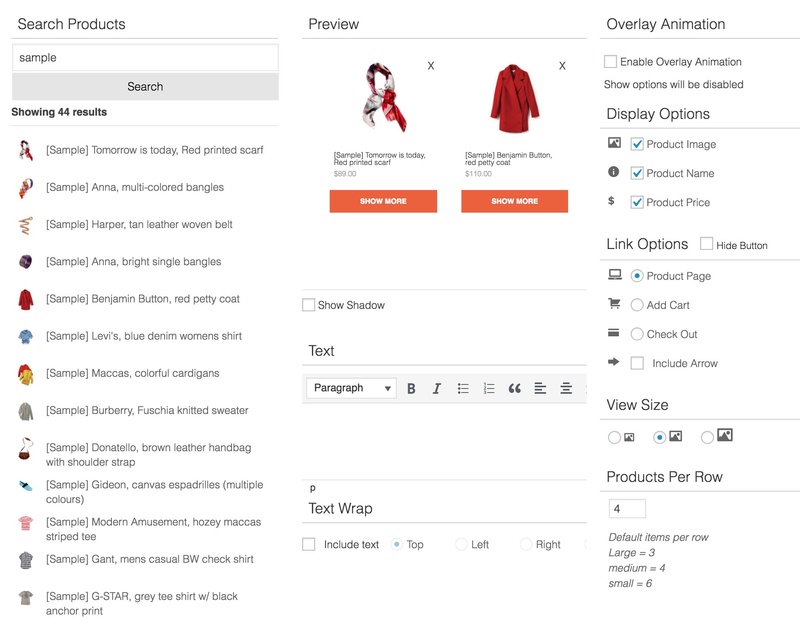 Drop in product images, text, pricing and CTA in one step. Search entire catalog for desired product - no need to leave WordPress. Get the style you’re looking for with adjustable product display, custom colors and editable button text. Download the plugin and head to your WordPress admin console to start integration process. Connect WordPress to your BigCommerce API user account to integrate your store. Simply drop products into the WordPress editor and publish to start monetizing your content! Monetize your content with the #1 and only solution to integrate BigCommerce and WordPress. Join the BigPr.es newsletter for news & updates! Copyright © 2018, Groove Commerce, LLC. We at Groove want you to be completely happy with any product or service you buy from us. If you have any questions, concerns, or problems, please let us know. Responses to your purchase email will automatically land in our inbox. If you decide your purchase of a plugin was not the right decision, we want to make things right. Within 30 days of any purchase, Groove will refund the full price you paid upon request. Simply contact us by replying to your purchase email and let us know you’d like a refund, with a clear explanation of why you’re not happy. No refunds are provided after 30 days. You will be charged a one-time payment of $89 for the first 12 months of your subscription. Your subscription will be automatically renewed at the end of your first 12 months at the same rate. But don't worry; we'll send you a notification 30 days before your subscription is set to renew to remind you of your upcoming payment and of course, give you the option to cancel. Email bigpr.es@groovecommerce.com for Help & Support.